* Food and Beverages Coupons will be allotted at venue. 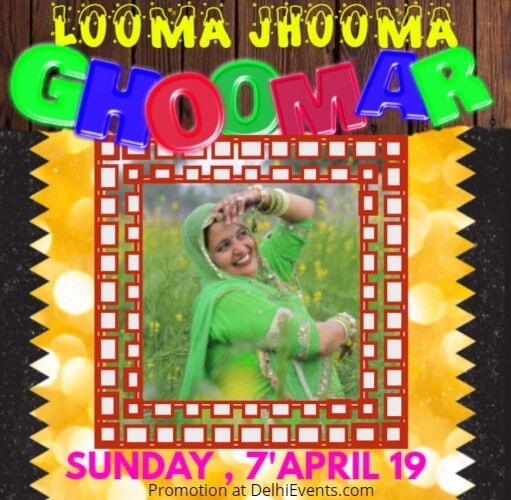 GHOOMAR is one of the Rajasthan’s folk dance form exclusively performed by women on special occasions and gatherings.Women performing GHOOMAR whirls around wearing colorful and fascinating Rajasthani dresses. The idea to bring GHOOMAR from pleasing sand-dunes to glittering world is to revive the Lost dance form & to get acquaintance to our young generation. Langas and Dolis singing mesmerizing folk music using traditional instruments like... Nagaras, Dhab, Khadtal, Chang, Sarangis & Claps to make dance looks more elegant and amazingly beautiful.